Hello and welcome to exampundit. 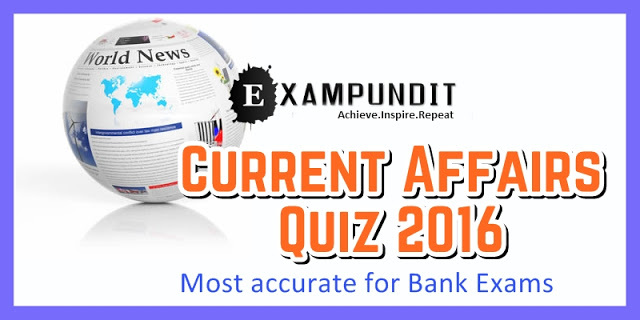 Here is the second set of Non-Financial Current Affairs Questions for the upcoming UBI PO and RBI Grade B 2016. These are based on the Current Affairs from July, 2016 last week. The topics include, news related to India & its states, world news, appointments, days, awards & honors etc. the first contributor to UN Trust Fund for ___________. project outlay of India’s first Water Metro project in Kochi? Under-20 Championships was held in ___________. with his Bangladesh counterpart Sheikh Haseena inaugurated the Petrapole Integrated Check Post (ICP) in which state? is associated with which sports? following nation was recently announced free of measles by World Health Organisation?